Uponor manifold incorrectly installed. Can I simply reverse the pieces? I have a radiant heating system in my home, and I noticed my uponor manifold is installed incorrectly. I have attached a photo below. As you can see, the hot water is going into the return line of the manifold, and the cold water is coming out of the supply side. Overall the system works, but Uponor said this isn't optimal. Also, the flow meters don't operate at all. Can I simply swap the two manifold pieces in this situation? The water lines to/from the boiler are copper and can't be moved easily. The red loops don't have any slack in them so I can't move them. But I think I can just swap the placement of the two manifold pieces. Is this right? You should be able to. Which one is now the supply? Having the flow backwards will cause the flow meters not to work as you've discovered. Other than that, probably not an issue. You should have no problem switching them other than purging air which may be minimal if the manifold is higher than the tubing. I see no issue swapping positions. Check the middle pex connection on top as it looks pretty misaligned in the fitting. I am surprised it doesn’t leak. I haven't used those manifolds so I could be wrong on this, but it looks like you can remove, and just swap out the flow meters with the flow valves. It looks like the actual manifold of the supply and return are identical. If ever actuators were added, they do not like to work against reverse flow. I'd change it if you can. 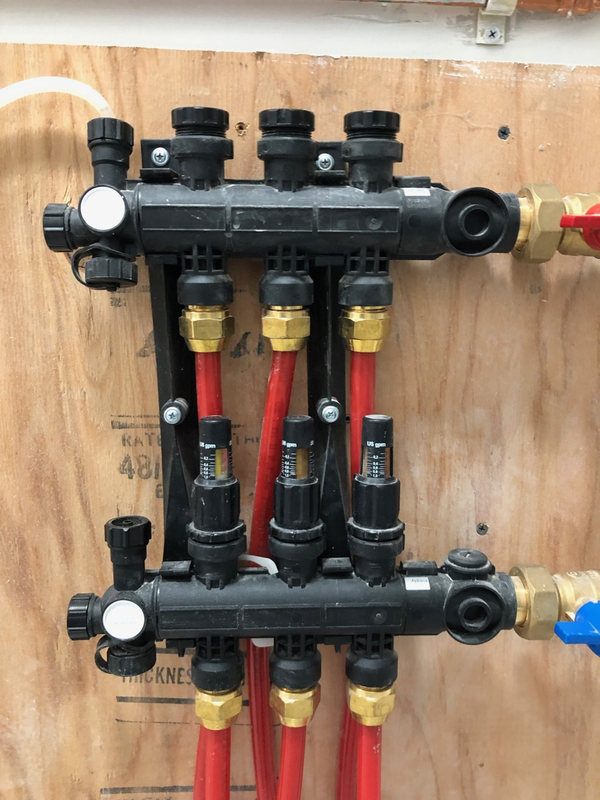 I contacted Uponor and they said that while most of their manifolds would work fine if reversed, this one (the plastic version) might restrict flow in this direction. So they recommend swapping the pieces. Thanks everyone for the help on this.